Over 200 years ago, Lewis and Clark discovered the Beaverhead River hoping to find a Northwest Passage. William Clark was overheard saying, “Oops” when they realized their portage over the Rockies was going to be an extra 250 miles. So it goes…. Today, the Beaverhead River flows out of Clark Canyon Reservoir Dam creating one of Montana’s blue-ribbon trout streams; blessing the landscape with cool nutritious water always competitive with other rivers for the largest trout per river mile. The Beaverhead is narrow with undercut banks, plenty of fly devouring brush, and surprisingly, home to very muscular and combative brown trout. The upper Beaverhead is narrow, tight and seeming to require tiny little Mayfly nymphs in order to be productive. When the stars align, delicate PMD’s appear offering truly world class angling. 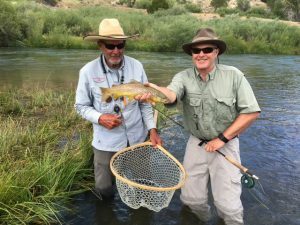 Our guides also fish the middle Beaverhead. Our private access agreements, with a few kind, generous, and visionary landowners, allow us to concentrate on productive runs, pools and riffles. These floats are high risk/high reward with the reward always outweighing the risk. We float places with a name like “Task to Trash” putting in at the town of Dillon wandering downstream in search of fish. The bottom Beaverhead float begins at Gems Bridge ending at the north edge of the town of Twin Bridges. The float is long and beautiful, and again, the fishing can be hit or miss but you have exceptional days with Hoppers, Blue-Winged Olives, Royal Wulffs, the ubiquitous Purple Chubby and San Juan Worm along with a variety of streamers. Plus, there is a very good chance you will not see another angler along the way, which becomes paradise. The Beaverhead River is where streamer fishing could have you on the verge of religious rapture. The price can be a lot of lost flies in the bushes and banks, but the reward exceeds the loss when a charging trout assaults your fly. Streamer fishing is productive in the spring, summer, and fall. Fishermen should always have a healthy selection of streamer flies: Big Hole Crawlers, White Zonkers, Yellow Yummies, JJ Specials, Double Bunnies, Sparkle Minnows, along with mystic specialties residing in your guides fly box. It is also crucial to remember that streamer fishing is about having the fly pulsate, flash, vibrate, palpitate, oscillate and quiver through the stream. Streamers are about action and trout tremble with they appear.